The complete name of this cereal is Froot Loops Smoothie With Yogurty-Covered Cereal Pieces. On the box at the bottom it says, "Good Source Of Calcium". Basically, this is just Froot Loops with what feels like stale pieces of Froot Loops thrown in. The "yogurty-covered" pieces offer nothing but additional sweetness - no flavor, no creaminess, no crunch. When eaten alone, the new pieces have a certain milky texture on the outside, but as you might expect, that milky texture is unnoticeable when it's floating in milk. The new pieces are slightly tougher to chew than the average Froot Loop piece. I'm sure this was meant to be fun and entertaining for your mouth, but since it just feels like Froot Loops gone stale, there's nothing fun about it. As for the claim that this cereal is a good source of calcium. Take that with a grain of salt. Yogurt is a good source of calcium. Yogurty-Covered cereal pieces... not so much. At 10% of your daily recommended allowance, the same serving of Wheat Chex offers the exact same amount of calcium. The #1 ingredient in this cereal is sugar. That's 11 grams per serving. Bad texture and shady claims... this is just a classic cereal gone wrong. Avoid this one. 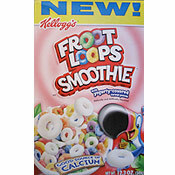 What do you think of Froot Loops Smoothie? This was the best cereal when I was a kid. The yogurt covered loops melted a wonderful taste in your mouth. They need to come back to grocery stores near me. I felt exactly the same way... the yogurt pieces were hard and felt stale underneath. I expected the fruit taste to resemble a smoothie.... why even call it a smoothie. BTW - really like this site! Not bad - I liked the taste. Was this some sort of sick joke. Horrible! Nasty. Doubt I'll finish the box. A real shame.